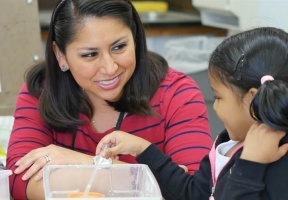 The Department of Family and Support Services and Chicago Public Schools announced a new early education center at Passages Elementary School – the fourth center to be announced this year. The centers provide quality early learning services, just as new data from CPS underscores the benefits of ramping up free pre-k for all the city’s 4-year-olds. Once built, the new early education center at Passages Elementary School will serve approximately 100 children a year from birth through five years old, and will be run in conjunction with the K-8 charter school and Asian Human Services. Passages Elementary School serves the West Ridge community, with a focus on the needs of immigrant and refugee students. The city is investing in four additional early education centers at Dore Elementary in Clearing, Perez Elementary in Pilsen, Gads Hill Center in Brighton Park and Little Angels Learning Center in Englewood. Families can apply for preschool programs through the universal online application. All locations can be found at http://www.chicagoearlylearning.org.